​This is a complete ground up redesign of the Atari 8-Bit Computer Motherboard, created with an emphasis on more modern methods of mass storage/retrieval, beyond floppies, and beyond cartridges. With it's built-in IDE interface and the Ultimate 1 Megabyte's advanced firmware, an attached CF Drive adapter will greatly exceed the capabilities of all the other disk drives that came before it, including an actual hard disk drive. And although there is a cartridge style port connector on the main board, its primary focus is on providing internal parallel expansion when coupled together with the adjacent ECI port, thus giving the 1088XLD a powerful future upgrade path. If you ever found yourself envious of the C-64's renowned SID chip, a precursor to the Apple IIGS Ensoniq wavetable synthesis sound chip, no longer will this be the case. Because when it comes to sound effects and music, the XLD's built-in Dream Blaster MIDI Synthesizer capability outshines them all. Couple this with dual Pokey chips, and you have the ultimate audio experience in full stereophonic sound. And did we mention MIDI? 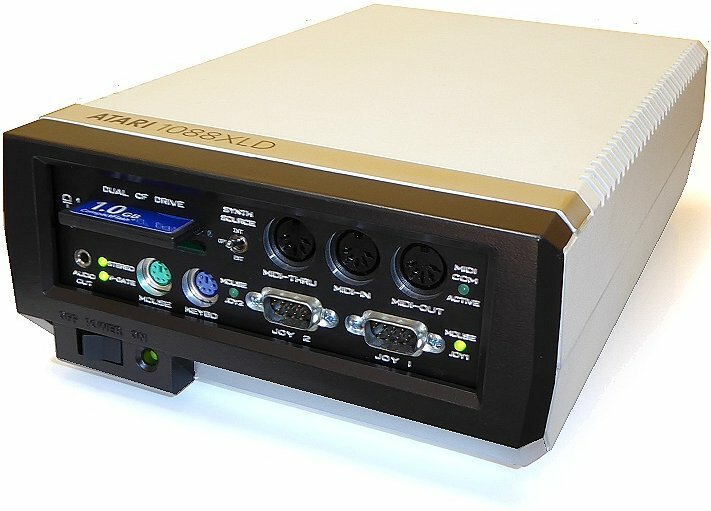 The 1088XLD provides a MIDIMATE compatible MIDI interface, sporting not only the typical MIDI-IN and MIDI-OUT jacks, but also a MIDI-THRU. Utilizing the Synth Source select switch, either MIDI-OUT or MIDI-IN can be directed at the internal S2 module that we talked about earlier, or simply routed out to an external MIDI device of your choosing. Uses any PS/2 device and converts it into a form that the Atari OS will understand, while also bringing advanced macro functionality, independent of any constraints of existing programs and applications. Because of it's inclusive UAV video board, the standard composite and S-Video sources are of a quality rarely ever seen on any Atari 8-bit computer. And with an easy upgrade path for either a VBXE or a Sophia video board, beautiful RGB output is also possible in tandem with the standard video, or in lieu of. To really give it a truly XL flavor, this imaginative re-creation uses a form factor that will drop directly into a virtually unmodified, non-working, and long abandoned Atari 1050 Floppy Drive case. Bringing new life to where there was none before. Home of the 1088XEL, UNO Cart, Ultimate Cart, UAV, RT8, and so Many Other Cool Atari Related Things. "A Manually Routed Creation in an Auto-Routed World"